Sean Fenton, who plays Xiao Hai in The Song of the Nightingale, is easily one of the most talented individuals I know. He has also become a good friend of mine over the past five years, and I've had the privilege to work with him on all three of my productions to date. Below, he discusses his role & creative work as well as his arts-related day job as the Intrinsic Impact Program Manager for the arts consulting firm WolfBrown. MIN: Describe your performance/theatre background. SEAN: I’ve been active as a theatre artist in the Bay Area for over a decade, as an actor, director, music director, communications manager, marketer, and consultant. As a long-time company member and contributor to both Bay Area Children’s Theatre and Kaiser Permanente Educational Theatre, one of my passions is theatre for young audiences—particularly the creation of new works. Through BACT, I’ve had the privilege of working with some incredibly talented people on a number of world premieres and national tours, including The Magic School Bus Live: The Climate Challenge, Ivy & Bean: The Musical, and Strega Nona: The Musical. Currently, you might say that I’m in my “Min Kahng Period.” From Tales of Olympus to The Song of the Nightingale, and now, the upcoming Where the Mountain Meets the Moon, my theatre life right now seems to be “All Min, All the Time.” And I wouldn’t have it any other way. M: That's hilarious. I've never thought of myself as being an epoch in someone else's life. Focusing specifically on Nightingale: do you relate to your character Xiao Hai? How are you different from the character? Sean Fenton as the hopelessly-in-love Xiao Hai. S: I do relate to Xiao Hai. He’s idealistic and principled, and he can also be a little bit impulsive and hotheaded. But at his core, it’s his love for his community, his family, and Mei Lin that drive him. And even when he’s profoundly disappointed in the choices others make, he still ultimately comes from a place of love. I think I can definitely relate to that, though I might be a bit more logical than Xiao. The roller-coaster Xiao goes through with Mei is also relatable to many folks, I think. In “The Girl I Know,” he sings about how Mei has become a person whom he no longer recognizes. I think that moment of discovery -- that simultaneous feeling of disappointment and loss -- is very relatable for many. But Xiao also has to learn that he can’t change someone else, most especially not someone he supposedly loves. Sometimes, you’ve just got to let someone fly…even if you prefer the ground. I love the moment when Xiao makes this realization. M: I've mentioned this before, but I truly feel like "The Girl I Know" has become more your song than mine. You bring so much to that number that I can't imagine it another way anymore. Your day job is also related to the arts. Can you describe a bit of what you do as the Program Manager for Intrinsic Impact? I assist arts organizations with collecting and analyzing high-quality audience data, with a focus on assessing and measuring the intrinsic benefits of arts attendance and participation. My clients are theatres, orchestras, and dance companies throughout the U.S. and abroad. I love what I do; my work lies in the perfect intersection of my passion for the arts and my fascination with data. M: What is the value or the purpose of emphasizing and measuring the intrinsic impact of theatre? S: As artists, whether we’re writing, directing, producing, or acting, we all want to make some sort of an impact on our audience. Yet when it comes to actually measuring audience impact, most companies lack the capacity to do so effectively. Perhaps this is easiest to explain when we think about the missions of arts organizations. Just about every theatre company has a mission statement or a purpose. But how do theatres know how well they’ve achieved their mission? How do you measure success when your mission is, say, ‘to create work that illustrates the common humanity connecting all of us,’ or ‘to provide thought-provoking theatre’? Just how do you measure that? How do you measure the value of art? What tends to happen is that “impact” becomes reduced to attendance numbers and ticket sales. This may be a great indicator of popularity or raw reach, but not necessarily for measuring how well the company has fulfilled its mission or how the artistic work actually affected those who viewed it. And when people do talk about the benefits of the arts, the conversation is often framed around instrumental or secondary benefits of the arts: the economic, social, and educational benefits -- or the societal by-products of art, if you will. The fact that arts programs can, say, boost academic scores or lower crime rates is compelling, and perhaps very important. But the arts can also provide pleasure, inspire awe, touch us emotionally, stimulate our brains, expand our aesthetic tastes, and bring us together. These intrinsic benefits are what make the arts unique and irreplaceable. My work helps arts organizations remember why they are important – and then provide the data they need to show it. This level of assessment, then, provides arts organizations with the competitive advantage they need when demonstrating their impact to boards, funders, and other internal and external parties. M: Could we have done this type of work with Song of the Nightingale? What might that have looked like? In what ways does Nightingale bridge cultural divides or bring communities closer? Does the show resonate emotionally more with women or men? How does the length of the play matter to different age groups? If audience members read the critics’ reviews or other posts on the Altarena website beforehand, did that have an impact on how captivated they were during the performance? Would pre-show talks or panel discussions be beneficial next time? Does reading your blog influence how many questions someone has after seeing the show? Was there a difference in overall satisfaction between subscribers and single ticket buyers? How about donors? Intrinsic Impact empowers arts organizations to have the answers to all these questions at their fingertips. And this data, in turn, can lead to immediate, actionable steps to improve the audience experience and further the theatre’s mission. M: I remember first reading about Intrinsic Impact and being so intrigued by the work, as well as surprised that such a feat is only now being tackled by the arts world. But I'm glad it's happening. I think it will serve arts organizations tremendously especially as the world gets more and more reliant on data. Anything else you’d like to share on any topic? S: Just a big thank you for including me in this amazing experience. So rare is the opportunity to be able to participate in a project’s development for almost its entirety -- from that first reading in your living room, to the staged readings, and then to a fully produced show, backed by a truly extraordinary creative team. I’ve been lucky to have had many wonderful arts experiences in my life, Min, but I think this one just might top the list. Thank you for the impact you’ve had on all of us and for your contribution to the arts. 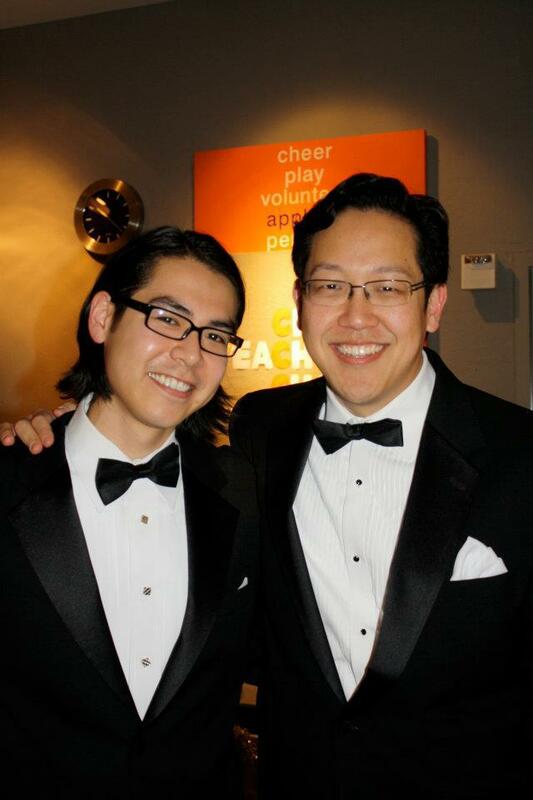 Sean and I after a holiday performance at Contra Costa Civic Theatre in 2011. I probably made him roll his eyes a few times then too. M: You might call it my Min-trinsic Impact. No? Too soon? *Sean may not have actually rolled his eyes as this interview was conducted through e-mail. It was just my best guess at his response to my pun. And if you haven't already seen The Song of the Nightingale, it closes Sunday November 24th. Get your tickets before they're gone! Posted on November 22, 2013 by Min Kahng and filed under Creative, Nightingale, Performing Arts, Musical Theater, Technology and tagged Sean Fenton The Song of the Nightingale interview.